Listen to “An Audio Bible Adventure: A Pitcher, a Torch, and the Sword of the Lord” (runtime: 10:47). When God asks something seemingly impossible of someone, God provides the supernatural power equal to the task at hand. How do you see this played out in the people you discussed previously? Large numbers don't mean anything to God; in fact, often He seems to work with the weak and the few in number so that it will show His strength and not our own. As this story brings out when the men were sent to drink water, often the Lord tests us when we don't even know that we're being tested. Use a personal story or a story from the Bible or history to illustrate this point. Answer questions about Gideon and then find the matching hidden pictures. Have an impromptu discussion on what your children know of Joshua’s life. Point out the events that led up to the time when Joshua became leader of the Israelites (i.e., the Israelites had been enslaved by the Egyptians, God anointed Moses to lead the Israelites out of Egypt, Moses appointed Joshua to be the next leader, etc. )Also, point out that the people who lived in the land of Canaan at the time were worshippers of Baal, Moloch, and other idols which involved many evil practices. Look at this map to show the route Joshua and the people of Israel took as recorded in the book of Joshua. Explain that Canaan is now modern-day Israel. Look up Israel on a map. Listen to “An Audio Bible Adventure: A New Leader and His Undercover Agents”(runtime: 7 min), a retelling of Deuteronomy 34 and Joshua 1 and 2.Highlight how this story shows God is faithful to keep His promises. He had promised His people a homeland, and they were now entering to possess it. However, it wasn't handed to them without effort on their part; God required that they do their part in order to gain what He had given them. And when Israel did so—God was with them, helping them supernaturally and miraculously to claim the land God had promised to their forefather, Abraham. Read “The Wall of Jericho Did Fall!” Scientists confirm this famous Bible story. Listen to “An Audio Bible Adventure: The Hoax of the Moldy Bread and the Day the Sun Stood Still”(runtime: 10 min), a retelling of Joshua 9 and 10.  Joshua chapters 7 to 12 continue the story of Joshua’s conquering of Canaan, chapters 13 to 21 detail his division of the land, and chapters 22 to 24 describe the tribes’ commitment to staying in Canaan.  Note: The story of Joshua and Caleb scouting out the land of Canaan is found in Numbers 13 and 14, and will be touched on in an upcoming lesson plan on Caleb.  Here’s a crossword on the story of Joshua and the walls of Jericho.  Here’s an activity page maze around the walls of Jericho.  Video: Books of the Bible: Joshua. Using a whiteboard, blackboard, or piece of paper, have your children help you draw a rough timeline of Moses’ early life based on what they know. Then continue to fill out and refine this timeline as you read the following articles. Read “Adventures in Hebrews, Part 3,” pages 2–4: a brief version of the early part of Moses’ story, as relayed in Hebrews 11. Watch the music video “Baby in a Basket,” or read “The Beautiful Baby Who Was Found in a River” for the early part of Moses’ life. Ask your children if they think that God had a plan for Moses’ life from before he was born. If they answer “yes,” then ask what makes them think so. Discuss God’s miraculous protection in saving Moses from the Nile, and His great foresight and planning in having Moses grow up as the son of pharaoh’s daughter, and how that might have prepared him for the role God would have him play later on in life. Ask your children why they think God used a burning bush to talk with Moses. Discuss how God wants to communicate with us all the time, but often we are too busy to listen, and so He sometimes uses miracles or He allows things to happen that help us be still and listen to His voice. If you have a personal account that illustrates this point, tell your children of it. Read of Moses’ early life from The Picture Bible or another illustrated Bible book. Read “Chariots in the Red Sea,” a news article on recent discoveries that provide evidence regarding the Bible story found in Exodus 12 to 15. Discuss what your children know of Abraham’s life. Read this article, for a brief background on Abraham’s life. Discuss how Abraham allowed Lot to choose the choicest piece of land for himself. It would have been easy for Abraham to claim the best land for his own family, which was his right as the top elder of the entire clan, and the one who had initiated the journey from their former home, and the one who had invited Lot to join him. But Abraham preferred his nephew, and God rewarded his generosity. Read “Adventures in Hebrews, Part 2,” pages 5–6: Abraham following God to a land of promise; God’s covenant with Abraham concerning his descendants. Read of the great sacrifice God asked of Abraham in Genesis 22:1–18, or the first page of “Adventures in Hebrews, Part 3” for a short recap. Reflect with the children on the above story, thinking about it from Abraham’s point of view. Describe how Abraham had waited for many years for God to fulfill His promise of having many descendants, and after he finally had a son, God asked Abraham to give the son back to Him. What compelled Abraham to obey? Look up 2 Chronicles 20:7, Isaiah 41:8, and James 2:23. Each of these verses describes Abraham as a “friend of God.” Brainstorm components that good friendships are made of (e.g., trust, loyalty, openness, spending time together, etc.). Discuss how this was what Abraham’s relationship with God was like, and what our relationship with God can be like as well. Also look up John 15:14. Read Abraham’s story from The Picture Bible or another illustrated Bible book. Have an impromptu discussion on what your children know of the prophet Jeremiah. “Jeremiah: Man of Tears”: retold in story format, with illustrations. “Questions and Answers about Jeremiah”: some points on the book of Jeremiah, main events of Jeremiah’s life and which Bible chapters to find them in, and a few stories. If you have an illustrated Bible available, read about Jeremiah’s life from it. Discuss the following with your children. Jeremiah did not want to be a prophet. He thought he was too young and had little skill at speaking. God told Jeremiah that He had chosen him to be His prophet before he was born (see Jeremiah 1:5). Once Jeremiah accepted God’s call, his life became a testimony to how God anoints and empowers His followers to perform His will. It’s good to remember that even if we may not feel that we are good at something, God can anoint us for what He asks us to do. In the book of Jeremiah, we see the people of Judah frequently disobeying and ignoring God. It’s easy to wonder at their folly in doing so, but we can ask ourselves if we are doing what God tells us to do and what we know to be right and godly based on what the Bible tells us. Look at a timeline of the rulers and prophets of Jeremiah’s time on page 217 of this document. Look at this chart and discuss how Jeremiah, Daniel, and Ezekiel all lived during the same time period and how God was speaking to all three of them. Read the “What’s interesting” section at the bottom of the web page. Moses and Joshua had led the children of Israel to the Promised Land, and the Israelites were now living in Canaan (Israel). The judges of Israel up to this time had all been male. Read “The Judges of Israel” or this chart, which goes into greater detail about the individuals who served as Israel’s judges during this time. Note: The story of Deborah and Barak’s victory over Sisera can be found in Judges 4. Judges 5 is a song of praise to God that Deborah and Barak sang after the victory was won. 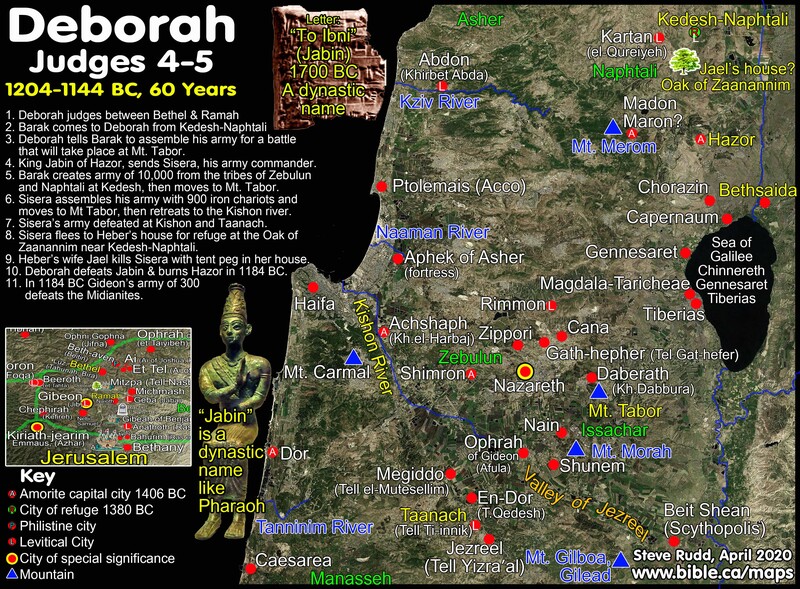 Look at this map showing the various places that are mentioned in Deborah’s story. After reading the story of Deborah, discuss the following with your children.